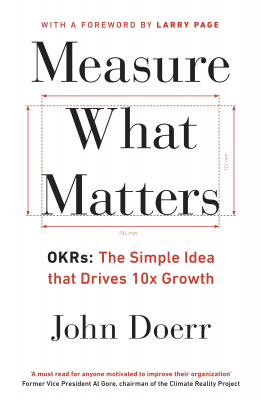 Measure What Matters : Okrs The Simple Idea That Drives 10x Growth - ubiq bookshop: the best place to buy books! OKRs are one of the best-kept secrets of the startup world. Google and Amazon have both sworn by their effectiveness for years. And yet most people have never even heard of them. Standing for objectives and key results, OKRs offer a revolutionary approach to goal-setting that helps companies focus on their most important initiatives, streamline the most essential and scale those goals across the organisation. Legendary venture capitalist John Doerr first introduced OKRs to Larry Page and Sergey Brin in 1999, when Google had forty employees - a moment that Eric Schmidt has since described as 'changing the course of the company forever'. In this book, Doerr reveals the true power of this approach. He explains how companies from Amazon to Zynga have enjoyed phenomenal growth, agility and transparency of purpose as a result of making OKRs standard practice - and reveals how you can, too.